The success of your HRIS project also lies in its implementation. For this reason, the experts at NEEVA support you throughout solution deployment, from the start of your project all the way to everyday use of the application in your organisation. Drawing on over 10 years of experience, the experts at NEEVA have acquired methodologies and best practices to ensure our customers’ success. NEEVA has handled over one hundred projects with businesses of all sizes and from all industry sectors. 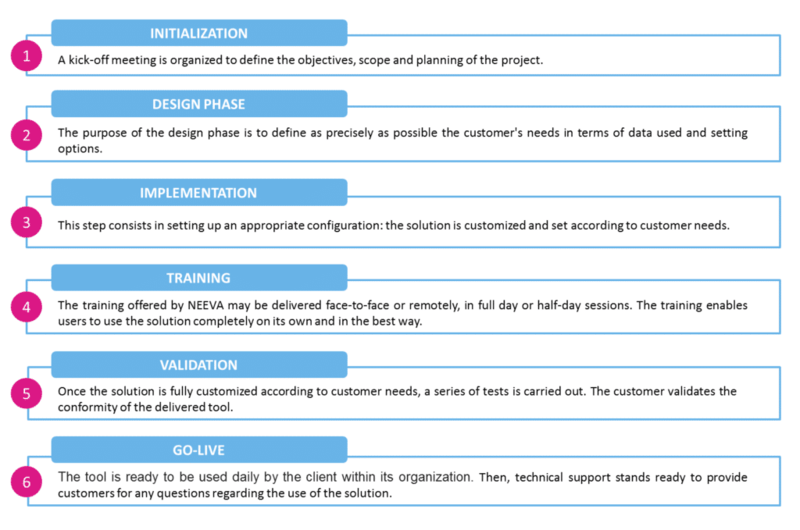 NEEVA offers two different deployment methods, you can therefore choose which one best suits your requirements and issues: project method or turnkey method. During the management of your project, our objective is to give you the necessary means and resources to best make use of the NEEVA solution. To achieve this, the experts at NEEVA offer bespoke support, adapted to the operation and characteristics of each customer. What’s more, the project does not only need to be driven by operational needs, but also through target goals that are planned ahead. Dedicated to SME or local Authorities, the Turnkey method offers the advantage of efficient solution deployment support while offering a customised methodology and budget. Milestones are shortened and consolidated in order to implement your project in the shortest possible deadline. You benefit from a customised solution (at configuration stage) whose implementation is simplified because of the “Turnkey” method.